Our outdoor security camera works hard, rain or shine. Ooma Smart Cam is already well known for working indoors, but it’s also one of the best outdoor security camera systems on the market. 100% wirefree, the camera can be placed or mounted almost anywhere inside or outside your home. While you’re at the office, running errands, and spending time with family and friends, Ooma Smart Cam is hard at work protecting the indoor and outdoor areas of your home. For instance, if there is a loud noise outside (such as a back window breaking) or unexpected motion (like an unfamiliar person in your backyard) the camera will begin automatically recording in less than a second so you won’t miss a thing. 6 months of rechargeable battery life: Even during internet and power outages, the Ooma Smart Cam will continue recording. Full 1080 HD video: With Ooma Smart Cam’s top-notch video quality, you’ll be able to see every detail of the areas around your home. Less false alarms: Thanks to our state-of-the-art facial recognition technology, you can customize settings for family, friends, and even pets. This means you won’t get unnecessary updates about your dog wandering around in the backyard while you’re at work. 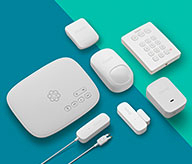 You’ll just get the home security notifications you need when you need them. It’s that simple. 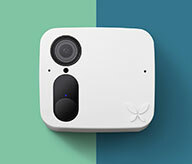 Mobile friendly: The camera’s intuitive design is controlled and configured through the Ooma Smart Cam mobile app for iOS (Apple) and Android. Night vision: This camera won’t ever sleep on the job. You’ll still get the home security camera protection you need, even in the dark. Weather can be unpredictable, which is why the Ooma Smart Cam is completely weatherproof. Even during cold, wet, snowy or rainy conditions, your camera will keep recording with onboard memory. With its IP65 water resistance certification, Ooma Smart Cam takes outdoor home protection seriously. Place or mount your outdoor camera anywhere. Every Ooma Smart Cam includes a wall mount with a magnetic connection to the camera. This makes it easy to pop the camera off the mount for charging and pop it back in place afterward. With its standard tripod socket, the Ooma Smart Cam is also compatible with most indoor and outdoor security camera mounts. To see all of Ooma Smart Cam’s features and benefits, visit our home security camera page, or watch the video below!